I remember the first -- and only time -- I ever made banana pudding. It was the early 1990's and my husband and I were newlyweds. We'd invited some friends over to eat supper and, since it was a hot summer day, I decided to make banana pudding for dessert. I never liked my mother's recipe which called for the custard to be cooked, so I tried a recipe that started with a package of instant vanilla pudding. Afterwards, my husband and I realized neither one of us really cared for banana pudding, either the old fashioned kind or the no cook version. 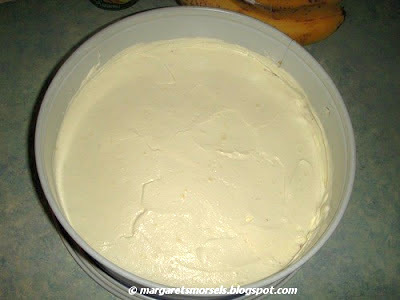 Several years later, a friend gave me the recipe for Banana Cream Supreme. In some ways, it reminds me of banana pudding, especially the versions made with pudding mix and Cool Whip. It's also layered like banana pudding, but there's no soggy vanilla wafers! It's not, like my son used to call it, cheesecake because there's no cream cheese in the recipe. The dessert is made in a spring-form pan. If you don't have one, substitute a similar size serving dish. Depending on what you use, you might not be able to slice the dessert into pieces, but it tastes just as good scooped into bowls. If you use a spring-form pan, don't use nonfat or low-fat ingredients because the dessert won't be firm enough to cut. This is also true if you substitute sugar-free pudding because it doesn't have the same consistency and won't set up like regular pudding. The recipe starts with a crust made from graham cracker crumbs, butter and sugar. To keep from dirtying another bowl, I mix this up in the spring-form pan and then press it in the bottom of the pan. The rest of the recipe is pretty straightforward. Whisk sour cream and milk until blended. Add instant vanilla pudding mix and whisk until the pudding is dissolved. Spread half the mixture over the graham cracker crust. Slice bananas and dip the pieces in lemon juice. This keeps the bananas from turning brown. 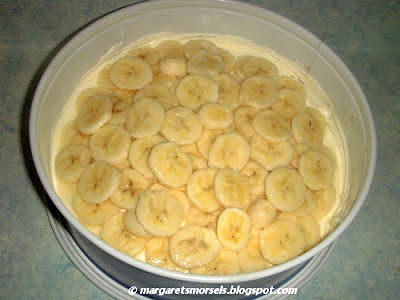 Arrange the bananas on top of the mixture in the spring-form pan. Add the remaining mixture covering the bananas completely. 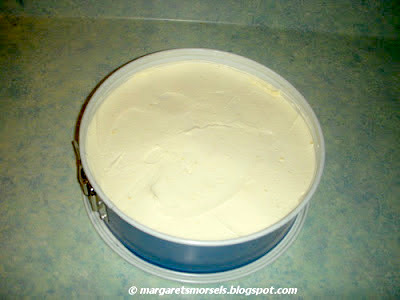 Cover the pan with foil and refrigerate overnight or until firm. When you're ready to serve dessert, remove the collar from the spring-form pan and slice the dessert into wedges. For a fancier presentation, sprinkle graham cracker crumbs on top of each serving. Whether you call it pudding or pie, this is a refreshing summertime dessert. It's also good served in the winter, spring and fall! 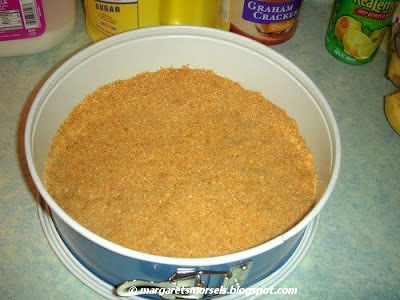 Mix graham cracker crumbs, butter and sugar in a spring-form pan; press mixture in the bottom of the pan. 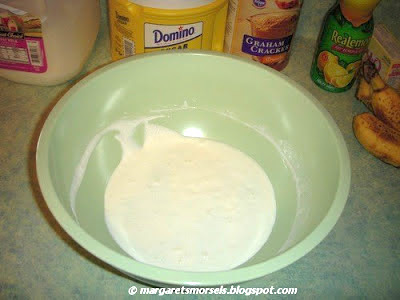 In a large bowl, whisk sour cream and milk until blended. Add pudding mix; whisk until pudding is dissolved. 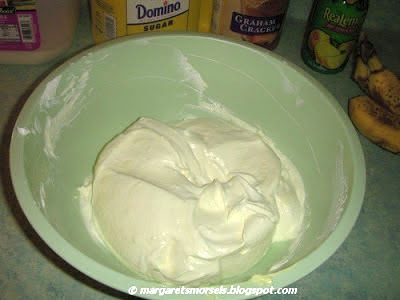 Gently fold Cool Whip into the mixture. Spread half of mixture over the crust. Dip banana slices in lemon juice. Arrange bananas over mixture in the spring-form pan. 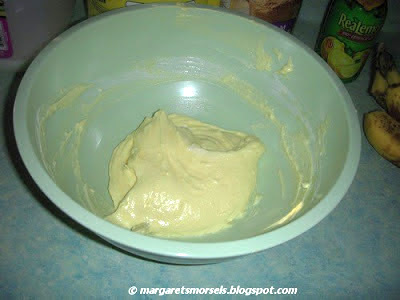 Spread remaining mixture over bananas. Cover the pan with foil and refrigerate overnight or until firm. To serve, remove collar from spring-form pan; cut into wedges. 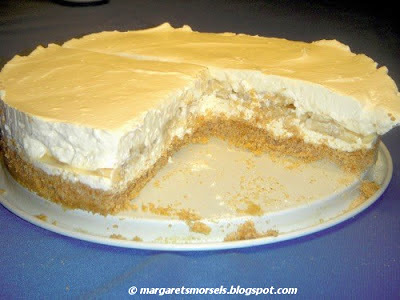 For a fancier presentation, sprinkle graham cracker crumbs on top of each serving, if desired. Refrigerate leftovers. 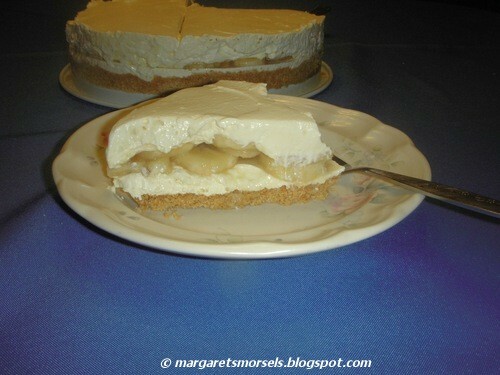 This pie takes me back to my childhood when my mother made a Banana Cream Pie, your pie looks delicious! Thanks, Rachel! This recipe is definitely a combination of banana pudding and banana cream pie. Thanks for the comment.